When we redesigned our newsletters, we came from far. I arrived in the company to find very bad emailing practices. No responsive at all, no TEXT version, absolutely all best practices were missed by my predecessor. But with several years of bad practices, how to tell our subscribers to open this new newsletter? If they were used to not open it, why would they now? And if they not, our redesign will be useless. All is not perfect yet, but with two tips, help user to open your newsletter and increase your open rates. 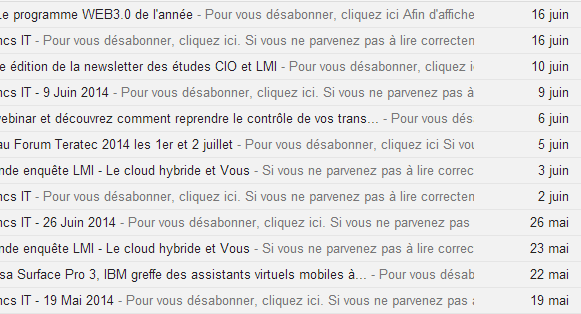 lemondeinformatique.fr fail at preview by asking readers to unsubscribe! In some case, like this one, the preview display to reader “click here to unsubscribe”! This is definitely not what we want readers do! The [if !mso] is here to prevent the line to be display on MS Outlook. Of course, this won’t work for all Outlook version, and outlook.com web app, per example, doesn’t care much of that. So we have to hack it a little more by adding the “font color” with the same color as the background. In all mail client (gmail, outlook application, apple mail…) the line won’t event be shown. In outlook.com, the line will be transparent be present. Resulting a “blank” line above the header. Use jokes, customizing them for special day per example, be creative! The second tip is not a code tip, it’s more an editorial one. Using custom subject line will be more remarkable by your reader than always the same “Our super daily newsletter”. Try to use the title of the most interesting story in your newsletter. this is what I am looking for, glad to landed here. Proudly powered by WordPress | Theme: Ixion (modified) by Automattic.